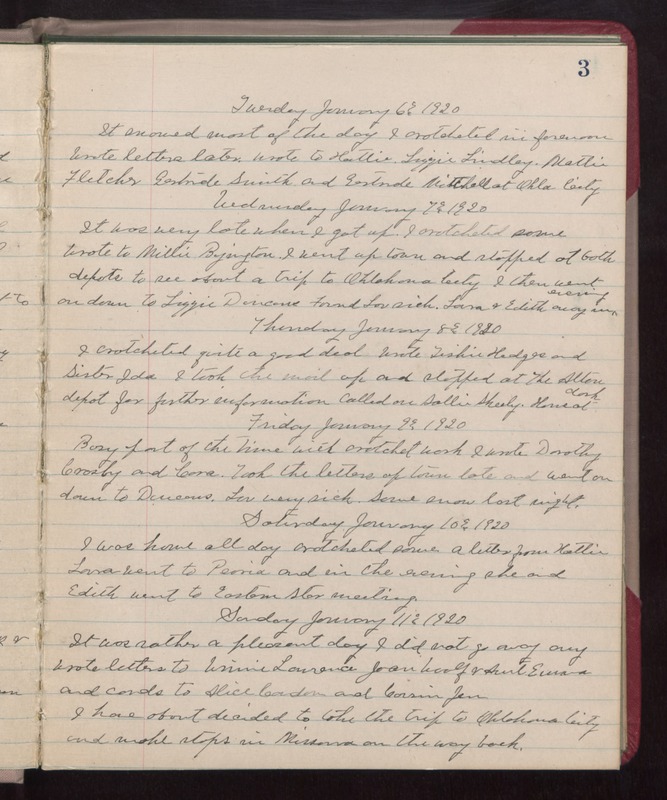 Tuesday January 6th 1920 It snowed most of the day I crotcheted in forenoon. Wrote letters later wrote to Hattie, Lizzie Lindley, Mattie Fletcher, Gertrude Smith and Gertrude Mitchell at Okla City Wednesday January 7th 1920 It was very late when I got up. I crotcheted some. Wrote to Millie Byington. I went up town and stopped at both depots to see about a trip to Oklahoma City. I then went on down to Lizzie Duncans. Found Lou sick. Laura & Edith away in evening Thursday January 8th 1920 I crotcheted quite a good deal. Wrote Tishie Hedges and Sister Ida. I took the mail up and stopped at the Alton depot for further information. Called on Sallie Sheely. Home at dark Friday January 9th 1920 Busy part of the time with crotchet work. I wrote Dorothy Crosby and Cora. Took the letters up town late and went on down to Duncans. Lou very sick. Some snow last night. Saturday January 10th 1920 I was home all day. Crotcheted some. A letter from Hattie. Laura went to Peoria and in the evening she and Edith went to Eastern Star meeting. Sunday January 11th 1920 It was rather a pleasant day. I did not go away any. Wrote letters to Winnie Laurence, Joan Woolf, & Aunt Erma, and cards to Alice Condon and Cousin Jen. I have about decided to take the trip to Oklahoma City and make stops in Missouri on the way back.